On the hottest day of the year so far, the sprinklers on the green of the tiny village of Honeybourne made miniature rainbows in the shimmering air. Jasmine Green’s triplets, Rebecca, Rachel and Reuben, squealed as they raced backwards and forwards through the water, while Jasmine folded the last of the bunting from her stall of homemade crafts and furnishings. ‘It’s been a fabulous day for it,’ she commented cheerily to the vicar as he wandered over. ‘The children have certainly enjoyed it this year.’ She looked fondly over at her offspring, now soaked through but grinning all over their faces. ‘Some of the adults have had a good time too,’ he replied, angling his head to where Jasmine’s husband, Rich, was sitting on a deckchair looking distinctly sunburnt despite his dark hair and complexion, grinning drunkenly and staring into space. ‘Who’s got scrumpy?’ Rich asked, now squinting up at them. ‘Richard Green, the vicar is standing right there!’ Jasmine giggled. ‘Not when the missus has made them herself, they don’t,’ Jasmine said with a mock scowl. ‘Fair point.’ Rich hiccupped. He was a good foot taller than Jasmine and she had to stretch up to kiss him. ‘Go and get your children, there’s a good boy,’ she laughed. He let go of her and staggered off. But when Jasmine looked up again, he was chasing the children through the sprinklers, making monster noises as he went, sending them scattering and squealing with delight. Some of the other villagers had joined in with their children. Jasmine stopped her packing for a moment and watched them all play their elaborate game. In her kitchen, a hundred miles to the north of where Jasmine Green was ushering her reluctant family into a van, Millicent Hopkin – Millie to the handful of people who dared get close enough – was sobbing. It felt like she did little else these days, though she was always careful to save it for when she was alone. Some would take great satisfaction in her pain. She probably deserved it, but that still didn’t give anyone the right to victimise her. The car had been the last straw. She’d spent the last three hours trying to scrub away the vile words. Whoever wrote the old rhyme about sticks and stones was wrong. The smashed windows, the faeces shoved through her letterbox, the mysterious taxis and pizza deliveries in the early hours that she had ended up having to pay for when they insisted she’d ordered them – she’d borne it all with a quiet fortitude. But the words… Words had magic, they had power – the power to heal, to hurt, to make things happen, and the ones she’d failed to remove from her car, even though she’d rubbed and rubbed until her hands were raw, had hurt her as much as any stick or stone could. She’d had enough. Drying her tears, she tried to concentrate on the task in front of her. The only constant in her life now was her creativity, and baking was the one creative thing she could still do that brought pleasure to others. Although these days she didn’t know who she could share this one with when the people she had once called friends had all turned against her. She had tried to be a good person, to set things right, but in the end it had meant nothing. Turning her attention to the mixing bowl in front of her, she added ingredients to the mix – cinnamon and nutmeg, vanilla, a pound of dried fruit, a sprinkle of heartsease, her unintentional tears – and thought about how she needed a new start, somewhere far away where people didn’t know her. Somewhere people wouldn’t judge her or hurt her or blame her for everything that had gone before. She focused on the thought, on the photo of a tumbledown old building on a property website that had captured her imagination, four walls in an adorably named village that might just be the new start she’d been searching for. 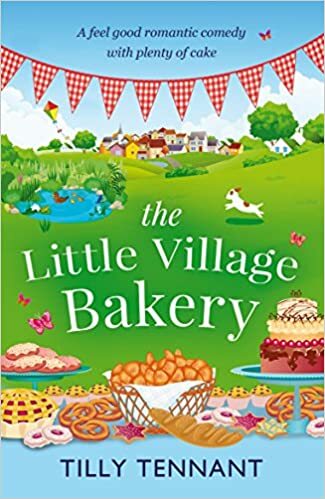 She closed her eyes, pictured the bakery – her bakery – and tried to imagine the sweet smells, the bright colours of the cakes, the chatter of customers, opening the shutters on every new day and welcoming it in; she tried to remember what happiness felt like, how it was to want to live. She longed for it with every fibre of her being. In less than a week, if the universe was finally smiling on her, maybe she would find out. When the mix was done, she poured it into a tin and whispered a last wish before she put it into the oven. She needed a new start. Perhaps the cake would make it so. Tilly Tennant was born in Dorset, the oldest of four children, but now lives in Staffordshire with a family of her own. After years of dismal and disastrous jobs, including paper plate stacking, shop girl, newspaper promotions and waitressing (she never could carry a bowl of soup without spilling a bit), she decided to indulge her passion for the written word by embarking on a degree in English and creative writing, graduating in 2009. She wrote her a novel in 2007 during her first summer break at university and has not stopped writing since. She also works as a freelance fiction editor, and considers herself very lucky that this enables her to read many wonderful books before the rest of the world gets them.